Legs courtesy of the Dents of Texas. On the 5th leg of a many-legged journey: from Ohio to Michigan to New York State to Virginia to North Carolina to Texas: from the cold blustery north to the tropical palm-treed south. And Texas is just a stop along the way. So, where am I going? So far I’ve been on the road for six weeks as a homeless itinerant gypsy. (Someone called me “homeless.” That’s true. I came up with the words “itinerant” and “gypsy.” After living most of my life under the auspices of The Department of Should, I like the freedom these words imply). 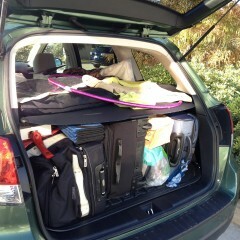 Six months worth of stuff for the road. Before packing my car and getting on the road, it took four months to close the deal on my townhouse, pack, fit in some work, stress about lots, and make decisions. Should I sell the sofa bed ? Give away my mother’s old mink hat? Keep my 200 souvenir pencils? Plus thousands more decisions that loomed large. Before saying good-bye to Athens, Ohio, and some wonderful people there, I needed some connection and grounding. I stayed a week with a friend and fulfilled my responsibility as an academic adviser for the fall semester at Ohio University. Is it a wonderful irony – advising students about their courses and careers when my own future is uncertain? Maybe not. Maybe advising anyone is best done with an open mind and heart, not with a mind answering to the Department of Should. Having been under that department for so long, I take some pleasure in steering students away from strict adherence to its dictums. (What are you really interesting in, I ask? And they give some great answers.) I, as they, must remember that just as one course and one semester constitute only a few steps on the path to somewhere, so too the legs of my current journey are making footprints on the way to somewhere. 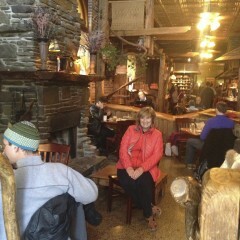 My sister-in-law in a totally hippie restaurant in Ithaca, NY. I drove to Ithaca, NY where my brother and sister-in-law (and my late mother) live. Cool and hippie town! From there to Virginia to visit one of my daughters and her family. Are you seeing something here? I felt I had to touch bases – literally touch with my feet and heart those places and people who were/are dear to me before my journey. 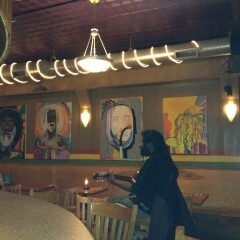 Great Cuban restaurant, Nine Mile, and astrology musician in Asheville. introduced me to Mayan Astrology. He said I’m a Blue Lunar Hand – and as developer and manager of the Blue Thumb Campaign in the ‘90s – this struck a chord that left me speechless. (The Blue Thumb Campaign’s aim was to raise awareness of the value of water as a natural and drinkable resource and to encourage people to conserve it, protect it, and get involved in community actions for conserving and protecting it. This campaign started under the American Water Works Association – a Google search tells me it is still active in new forms in many places. That touches me, I’m so proud to have been a part of that.) From there I took three days to get to Texas, to visit my son and his family. Believe me, I am very thankful for my wonderful friends and family. I’m here in Texas for a month or so. It’s a respite from packing and driving and figuring out which literal road to take. 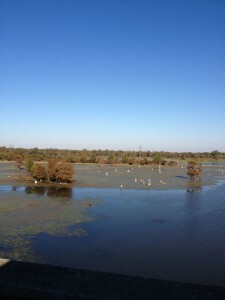 These Louisiana swamps fascinate me. So here are a few impressions from along the way. New York State has beautiful rolling hills. There’s a park in Virginia called Hungry Mother State Park. Virginia Tech University looks like a fortress. A city in South Carolina is named Maudlin (would not want to live there). Louisiana has 300 swamps (really eerie looking and wonderful to this northerner.) According to Louisiana road signs, you can get the “world’s largest gummy bears” in Louisiana or choose from 3,000 guns in one store (personally neither of those appeal to me). There’s a river in (I think) Texas called the Lost and Old River, and a city in Texas named Cut and Shoot. By June or July, I intend to be somewhere (and not in Cut & Shoot). In the meantime, let’s see what interesting things appear. By the way, I looked up another Mayan Astrology chart – and it said I was the Wind. Maybe that’s why floating around right now seems OK. Thank you more than I can express. I believe this is the next stage of my life; I am simultaneously terrified & excited. I married late, had my daughter 3 weeks after I turned 47, separated 18 months ago; want to move back “home” to the Midwest since I have loathed Los Angeles for only 50 years! Still and all the 14 year old daughter who I adore, swears she won’t live there even tho she loves it when we go to a tiny town in Michigan to visit each summer. Am I fooling myself? Is there better or the same but colder with only 1 friend? How DO people make these decisions? I’m so glad my journey resonates with you. It feels better to know we’re not alone in our quests for… and transitions to… I wish you good, good luck in your journey. Tough for a 14-year old to move. But it’s an opportunity for learning and growth. But it’s still understandable that she would not be eager to leave what she knows so well. A wise person once said to me – “you take yourself wherever you go.” So I’m trying to be realistic about what a new place will do for me – and what “baggage” I may need to leave along the way. So I’m thinking a new place will be what you (or I or your daughter)) make it. So we need to figure out what we want in a new place and know that not everything will be different – much of it will be the same. ( Like Kroger’s in Texas – see the “Immigration” story). Right now I’m on retreat in South Carolina by the beach, where I know no one. This makes me realize how important being in synch with some people is. And it emphasizes that I will have to make considerable effort to build a network of friends wherever I end out (which is probably back to Denver, CO). So all this is a bit scary – and exciting as you say! I am left with – some people live more adventurous lives than others. And it may not always be easy, or even conventional – but maybe we are lucky to be able to explore not only new places, but new dimensions of ourselves. And be able to share those new dimensions with others.